Not today, my friends. Instead we play. Suffice it to say I’m easily distracted, and the act of turning roving into yarn has become the act of turning roving into funny little creatures. I have some dehaired llama (in a lovely dark brown) that is sitting near my wheel, and my plan is to start working on turning that into yarn today… fortunately llama does not easily needle felt, or who knows what would actually happen to it. 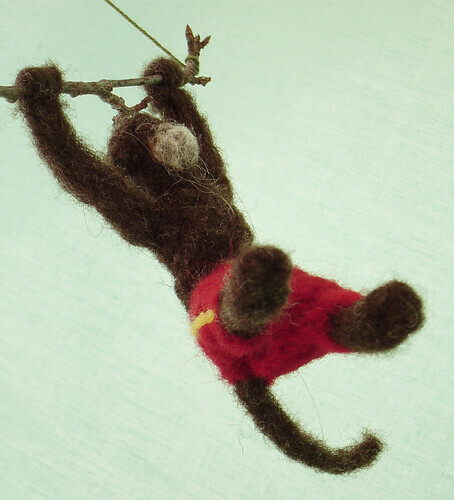 I am absolutely mad for this wonderful spinning monkey! You are an artiste!